Tata & Howard provided engineering services for the design, construction administration, and resident project representation for the installation of approximately 3,800 linear feet of 8-inch ductile iron water main on A, B, C, D, and Border Streets for the Whitinsville Water Company. All homes in the project area are multi-family ranging from duplexes to four units per building, and are of wood construction. The area has a history of fires, so fire protection was of utmost concern. The project began in February of 2016. 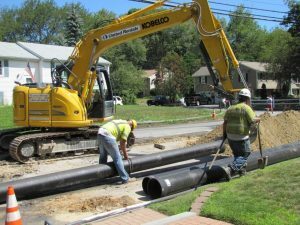 Each home had its water service replaced, and also received a 6-inch ductile iron water main that was installed with a gate valve and a cap so that the homeowner could install individual fire and water services to each unit. For example, the homes with four units could be tapped with eight new service lines, giving each home a fire service and a water service and increased protection from fire. 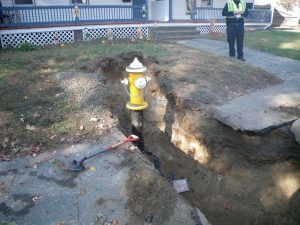 As added fire protection, Tata & Howard also replaced all hydrants and added four additional hydrants to the project area. All water main installation was completed in November of 2016, and final paving is scheduled to take place in the spring of 2017. Tata & Howard provided general engineering services to Bellemont Water System associated with responding to Arizona Department of Environmental Quality (ADEQ) violations and preparing an Application for the Groundwater Compliance 4-Log Removal of Viruses. Randall Pellatz, P.E., from Tata & Howard’s Flagstaff office, served as Project Manager. Located west of Flagstaff in the unincorporated community of Bellemont, the water system served approximately 100 customers — the majority of whom receive water hauled by truck to cisterns at their homes — as well as a few businesses, including a strip mall. The system also provides some fire protection. After the system repeatedly tested positive for E. coli bacteria and total coliform bacteria, a boil water notice was issued in August of 2012. In June of 2013, ADEQ issued a compliance order that required the Bellemont Water System to notify all customers of the boil water advisory and to install a treatment system that satisfactorily removes bacteria and viruses from the water. The source of the contamination was unknown. Tata & Howard’s scope of services included providing a response to ADEQ’s compliance order and developing a preliminary plan of action for maintaining 4-Log Removal of Viruses for the Bellemont Water System. In addition, a preliminary schematic plan for a chlorination system was developed to provide a residual chlorine concentration throughout the Bellemont Water System. Tata & Howard also provided design services for the proposed disinfection system and completed an assessment of the existing conditions of the Bellemont Water System, including recommendations, in a letter report. The system’s operator, Jeremy McCabe, installed the disinfection system, and in June of 2016, the Bellemont Water System underwent their final field inspection from ADEQ for chlorine residual and 4-log removal. They passed easily, and ADEQ was pleased to remove the boil water requirement. Mr. McCabe commented on how well the system now operates, and the system’s customers have expressed how happy they are to once again have safe, clean water. Tata & Howard provided professional engineering services for surveys and mapping; subsurface explorations; preliminary and final design; bidding; and construction phase services, including resident project representation, for the partial replacement of Laurel Reservoir Raw Water Transmission Main located on Lakeside Drive in Stamford, CT. The main was replaced after a history of multiple pipe failures. This project included replacing approximately 3,670 feet of an existing 13,540 feet of 42-inch diameter prestressed concrete cylinder pipe (PCCP) used to transfer raw water by gravity from Laurel Reservoir to the Stamford Water Treatment Plant (WTP). The pipe was replaced with 48-inch Class 52 ductile iron pipe. Three existing 8-inch blowoffs and two existing 4-inch diameter automatic air release valves in this section of main were replaced and upsized with new 12-inch diameter blowoffs and 12-inch diameter valves. The main was encased in concrete at three culvert crossings. Additionally, two 24-inch diameter access openings were installed in the existing 42-inch diameter main that was not being replaced to allow for inspections while the pipe was drained and out of service. The project also included replacement of four existing automatic air release valves on the existing 42-inch diameter PCCP that was to remain in service. Milford Water Company retained Tata & Howard to perform a visual inspection and prepare a report of conditions for Echo Lake Dam and appurtenant structures. Echo Lake Dam is located at the head of the Charles River in Hopkinton, Massachusetts, and serves to impound water to create Echo Lake, a public water supply reservoir for the Town of Milford, operated by the Milford Water Company. The dam measures approximately 198 feet in length with a structural height of 41 feet and a hydraulic height of 30 feet from the 24-inch outlet pipe to spillway crest. The dam was built in 1898, raised 10 feet with stone masonry in 1901, and raised 2.5 feet with stop planks in 1987. The dam is classified as large and high hazard potential. The Phase I Inspection / Evaluation Report was performed in accordance with MGL Chapter 253, Sections 44-50 of the Massachusetts General Laws. The purpose of the investigation was to inspect and evaluate the present condition of the dam and appurtenant structures to provide information that will assist in both prioritizing dam repair needs and planning/conducting maintenance and operation. The investigation was divided into four parts: 1) obtain and review available reports, investigations, and data previously submitted to the owner pertaining to the dam and appurtenant structures; 2) perform a visual inspection of the site; 3) evaluate the status of an emergency action plan for the site and; 4) prepare and submit a final report presenting the evaluation of the structure, including recommendations and remedial actions, and opinion of probable costs. The inspection was completed in April of 2015. 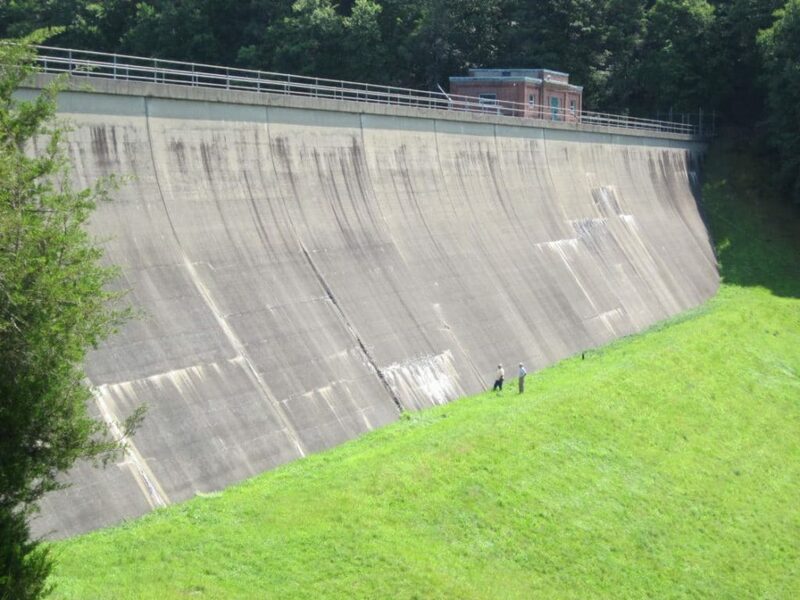 Saugatuck Dam is a concrete water supply dam in Weston, CT built in 1940, now owned by Aquarion Water Company. 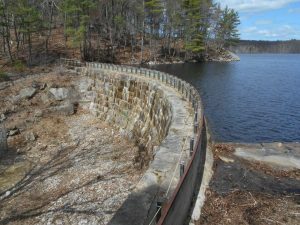 The majority of this project included repairs and modification to the gatehouse and gate chambers at the dam. Repairs included rebuilding the gatehouse walls, cleaning and painting the intake and outlet valves, and removing and replacing the stems and valve operators. Modifications included installing platforms made of steel beams and fiberglass in the gate chambers to provide safer access the valves in the chambers, and the interconnection of the 36” supply main and the 48” diversion main at the toe of the dam to provide greater flexibility for releasing water from the reservoir. 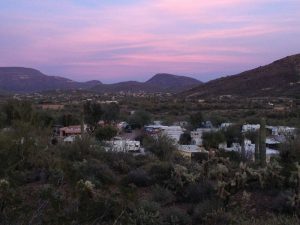 The Shangri La Ranch water supply, located in New River, Arizona, exceeded the running annual average maximum contaminant level (MCL) for arsenic. For the first quarter of 2015, the running annual average (RAA) was 0.0107 mg/L, and the RAA for the second quarter of 2015 was 0.0106 mg/L. The MCL for arsenic is 0.01 mg/L. Arsenic contamination within aquifers is not uncommon and is generally from natural mineral deposits. 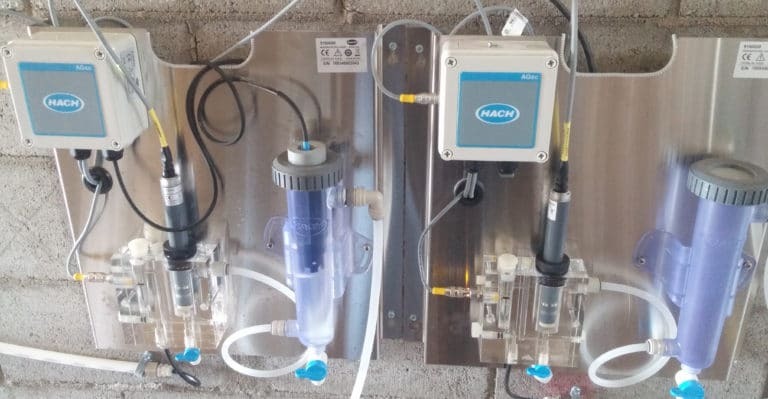 Arsenic in high enough concentrations can result in skin legions and damage to the circulatory system and cancer; therefore, it is important to monitor and minimize this contaminant from drinking water. 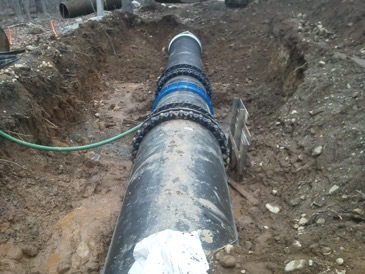 Tata & Howard was contracted to design approximately 2,000 linear feet of new 12-inch diameter ductile iron water main on Congress Street and West Fountain Street (High Service Area). The work included borings, survey, preparation of plans and specifications, and bidding. Construction of the High Service Area Water Mains took place over the summer, and was recently completed. Tata & Howard provided construction administration and resident observation services. 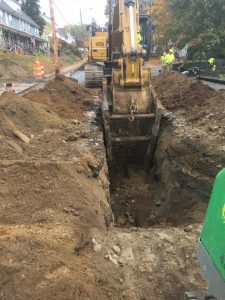 In addition, Tata & Howard was contracted to design approximately 2,400 linear feet of new 12-inch diameter ductile iron water main on East Main Street (Route 16). The work included survey, wetlands delineation, MassDOT permitting, completion of a Notice of Intent, preparation of plans and specifications, bidding, construction administration, and resident observation services. THE CHALLENGE: The Means Brook Reservoir Dam, a concrete gravity dam constructed on rock in 1916, required repairs in order to improve the safety and reliability of the structure, replacement of the deteriorated upstream and downstream faces of the dam and the crest, and rehabilitation and modernization of the gate chambers. Hydraulic, hydrologic and structural studies over the last several years have shown that the dam would be overtopped by about 3.9 feet by the Probable Maximum Flood (PMF), and that the dam does not have adequate stability factors of safety for this extreme loading condition. The upstream and downstream faces and the crest of the dam were severely spalled and delaminated, and the dam reportedly overtopped by about four inches during the 1955 flood. 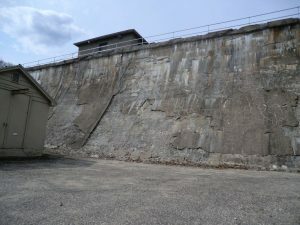 In 1977, the spillway was extended to its current length of 100 feet and a 2.1-foot high concrete parapet wall was constructed along the upstream crest of the dam. THE SOLUTION: Concrete repairs were made to the crest and both faces of the dam. The deteriorated and delaminated shotcrete and concrete were removed to sound concrete, anchor dowels and reinforcing installed, and new concrete surfaces poured. 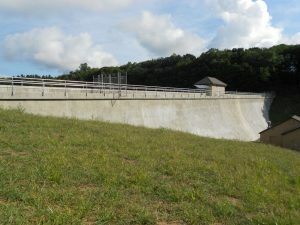 The upstream face was resurfaced to a depth of about six feet below spillway, and the downstream face to two feet below grade. Depth of concrete removal was between three and six inches. The new concrete surface was designed with a nominal thickness of 12 inches on the downstream face and six inches on the upstream face. Rock anchors were installed and post-tensioned in holes drilled through the dam into the rock foundation. The anchors will improve the stability of the dam and provide adequate factors of safety for overtopping by the PMF. One section of the spillway training wall was removed and replaced. The deteriorated concrete on the remaining sections was removed and the wall resurfaced. The repairs and improvements undertaken to the gatehouse and chambers included reshingling the gatehouse roof, providing a new steel plate exterior door for additional security, and blocking up the existing windows. The antiquated electrical system was replaced. Both of the inoperable sluice gates and their appurtenances in the upstream gate chamber were replaced. The former vertical brass ladders in the intake gate chambers were replaced with new fiberglass ladders. A base for a fall protection and retrieval system was installed. Wooden stairs in the lower gatehouse were replaced with a new aluminum ships ladder. The pneumatically operated butterfly valve on the 30-inch service main in the basement of the lower gatehouse was replaced with an electrically operated butterfly valve that can be remotely controlled. An extension stem and electric operator were provided. The operator was installed in the operating room above the valve, not in the basement. The 8-inch chamber drain and 10-inch auxiliary outlet gate valves were also replaced. Floor openings within the gatehouse previously covered with wooden hatches were replaced with aluminum grating with cover plates. Chain link fence was installed along portions of the spillway training wall for safety. Chain link fence and gates were installed at both ends of the dam for security. Galvanized steel pipe railings have been installed along the upstream and downstream crest of the dam for safety. 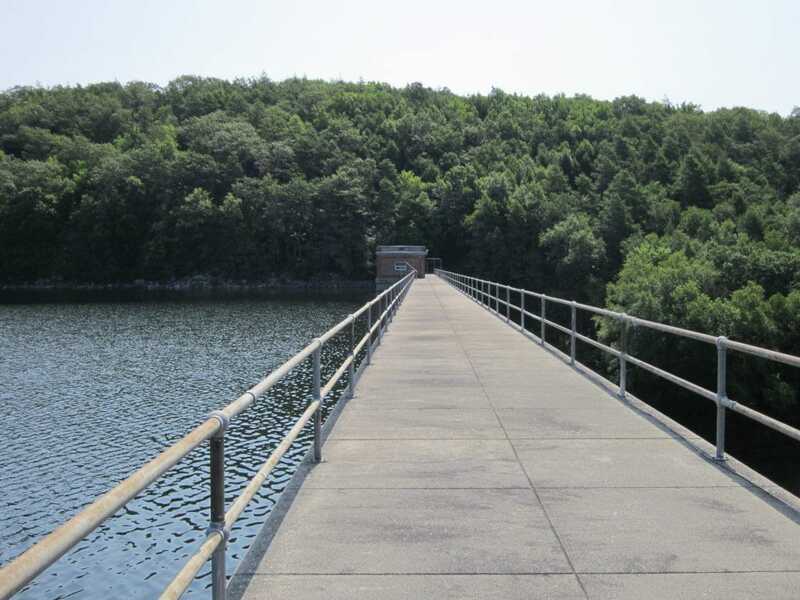 Steel pipe rails were chosen for the dam crest instead of chain link fence because the dam crest is subject to overtopping. PROGRESS: The project was completed in August of 2015.